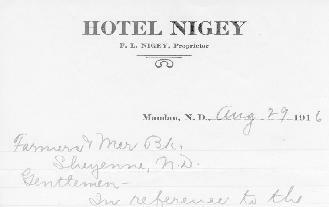 Frank L. Nigey built three-story brick hotel in 1906 targeting the "luxury" market then served only by the InterOcean Hotel located one block closer to the Northern Pacific Railway depot. Built in electrical utilities and hot and cold running water piped to all rooms. Common bathrooms provided on every floor. Local and long distance telephone service available on-site. The original building had one front and back row of rooms running parallel to Third Avenue NW, but it's success would prompt an expansion over twice its original size. The expanded building would house the city's first telephone exchange starting in June 1917, which was headquartered off its First Avenue NW entrance plus basement area. 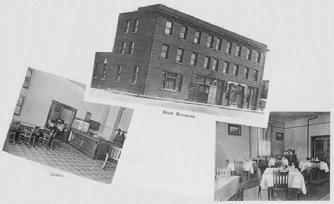 The building also housed Dahner's Music Store and in 1920 was the location of Mandan's first J. C. Penney's store from 1920 to 1928 operated by D. C. Mohr. 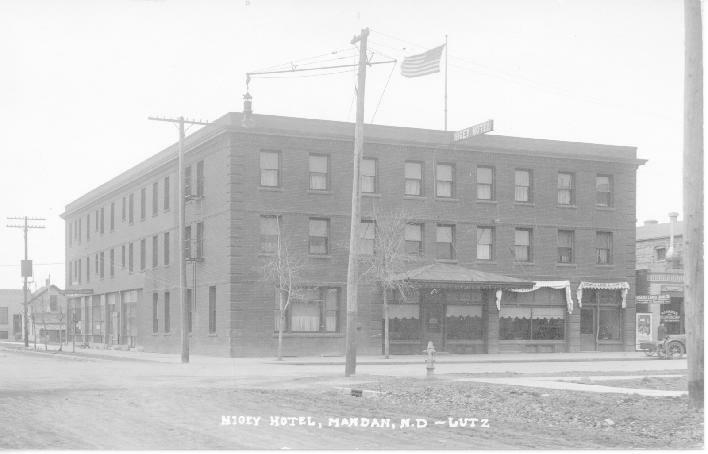 Rate for the hotels in Mandan in 1910 ran from $1.00 a night at the Hotel Mandan (located 5 blocks west of the railway depot on East Main Street) to $1.50 a night at the Dakota Hotel and Merchants Hotel. 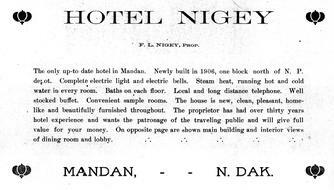 The InterOcean and Nigey Hotels commanded $2.25 and up for nightly accommodations. The City Cafe provided food service to guests as well as downtown business patrons. The restrauant was operated in 1939 through the end of 1941 by L.S. Schaff. In January 1941, the space was remodeled including horsechoe counter and reopened under the moniker of Stein's Eat Shop by Eddie Stein. 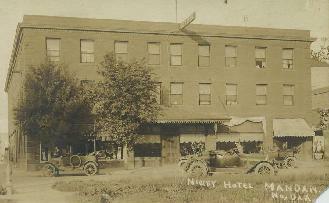 After the deaths of the Nigey's, the hotel was sold in 1929 to Frank Wetzstein and former Morton County sheriff Charles McDonald. It was operated it as the McDonald Hotel. Fred Sommerfield would buyout McDonald's interest after McDonald's death. 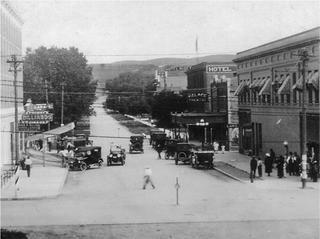 The Palace Theatre, owned and operated by partner Frank Wetzstein, was located in the adjacent lot to the south. The building was destroyed in a fire in April 1967. The fire was first reported by the patrions of the Corner Bar, then located in the basement of the northwest corner of the building. The fire broke out at approximately 10 PM coincident with the city's annual Firemans' Ball which was being held at the Elks' Club one block away. By then, the telephone exchange operated now by Northwestern Bell had been relocated across the street to a new larger building. Tenants of the building at the time included the Greyhound Bus Depot, Baumstarck Pfaff Sewing Center, the Mandan Credit Bureau and the offices of optometrists A. L. Larson and Michael Riisager in addition to the 54 rooms operated by the hotel on the top two floors. The building was razed and converted into a parking lot, which currently serves customers of the Mandan branch of Wells Fargo Bank.